For pets and small animals is the ideal energy source for your fence. This electric fence charger presents the ideal solution to keeping pets in your yard and keeping unwanted critters out. It comes with a mounting stake for easy installation and plugs into a standard 110-120 V outlet. This AC powered charger works up to one mile under ideal conditions. 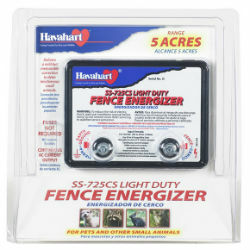 Used with the Havahart® electric fence kit, this AC powered electric fence charger plugs into a standard 110-120 V outlet.